When the future financial security of more than 700,000 people depends on the astute fund management decisions of 58 asset managers, it’s vital to put all the relevant risk-related data at their fingertips. For KLP’s asset management division, the challenge was to embed sophisticated risk modeling technologies into its day-to-day decision-making process by making it easier for portfolio managers and risk analysts to perform analyses and access the results. 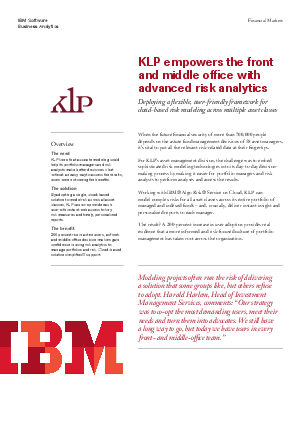 Working with IBM® Algo Risk® Service on Cloud, KLP can model complex risks for all asset classes across its entire portfolio of managed and indexed funds – and, crucially, deliver instant insight and personalized reports to each manager. The result? A 200-percent increase in user adoption provides real evidence that a more informed and risk-focused culture of portfolio management has taken root across the organization.